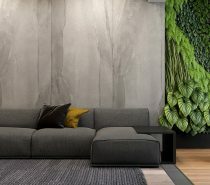 Posted on January 2, 2019 by William A.
Belonging to a proud pair of grandparents, the interior of this townhouse may be considered a little out of the ordinary for the more mature mindset that comes at this stage of life. 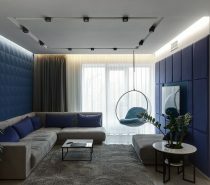 The first concept from the designers at Art Group was for a strict classical interior, but the modern thinking clients immediately rejected the notion. 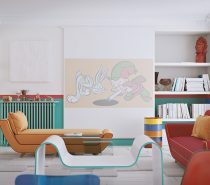 Instead the homeowners suggested that the team not restrain their imagination: “Guys, do not perceive us as conservatives, do not look at age and social status! 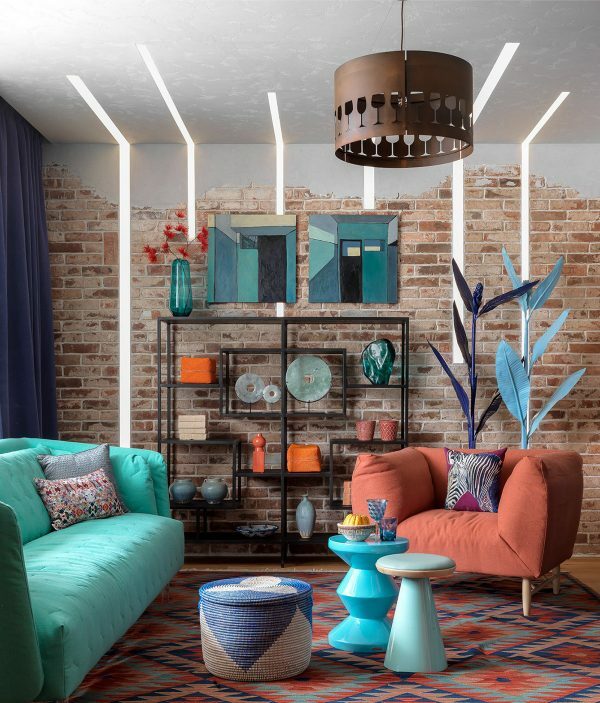 We want a modern, bright, even brutal interior.” The team came back with this bustling carnival of quirky colour, pattern and accents, where unique contemporary lighting design contributes in unexpected ways. 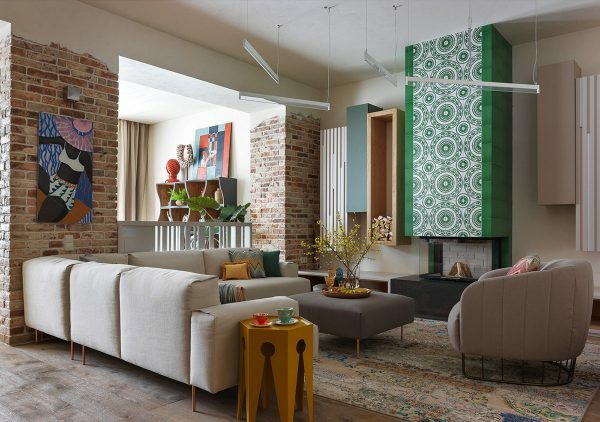 To meet the multi-generational needs associated with housing an extended family, the open plan townhouse required some creative zoning. A ‘territory’ was allocated for each generation of the family, and the large living room was defined as a common space for family meet ups. This is an occasional residence for the owners, as they spend the majority of their time in Almaty, Kazakhstan. The couple acquired the townhouse with the intent of using it as a country recreation place, where all generations of the family could gather and reconnect. 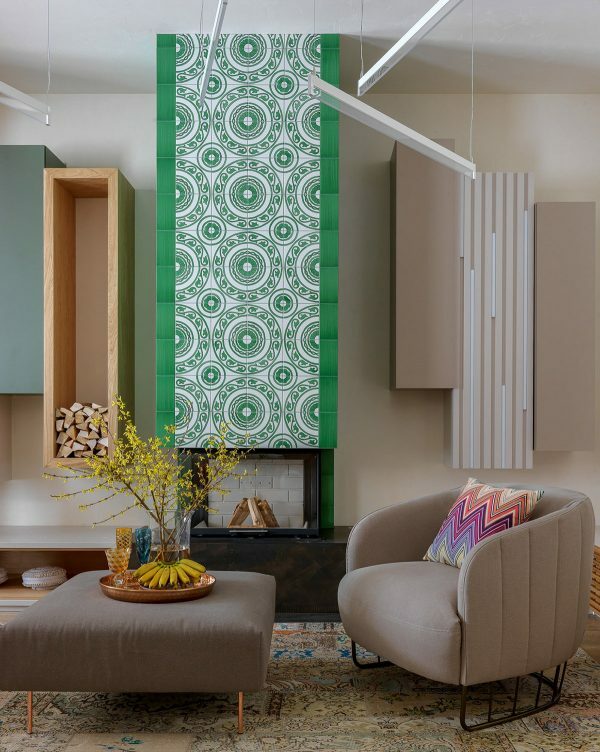 The fireplace is often the focal point of a family room but this one simply can’t be missed, tiled over in bright green and white pattern. A vertical box shelf is mounted to its left to hold cut logs ready to fuel the wood burning stove. 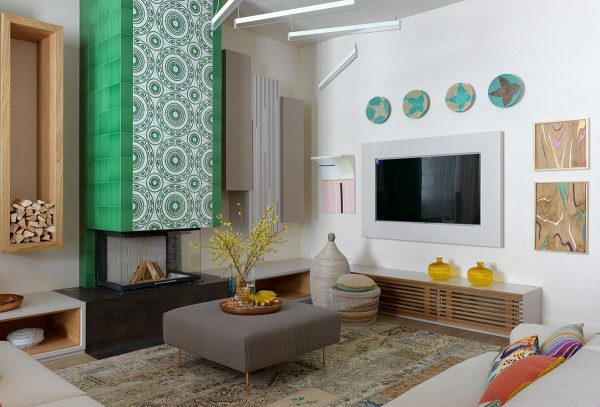 A flat screen tv is mounted on the adjacent wall, framed out in white to blend with the wall and art gallery. The decor may be a little jarring, but the living room furniture is soft and welcoming in taupe coloured cushioned upholstery. A small divide sections off another sitting place. 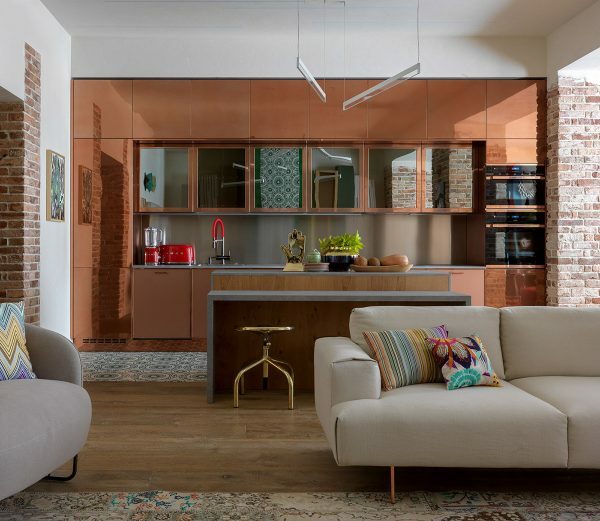 Copper cabinets make wow factor in the kitchen. 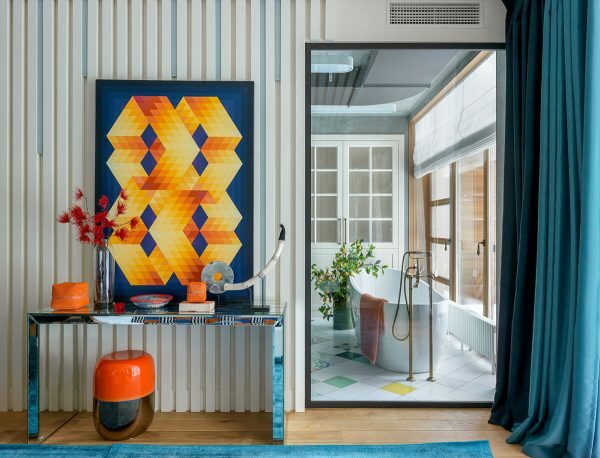 A run of mirrored wall cabinets reflect the lounge area opposite. The copper kitchen also has a central island where family members can pull up a gold stool and chat to the cook. To the right of the one wall kitchen with island, there is a family dining area next to the window. Multi-coloured legs twist at the base of the table. 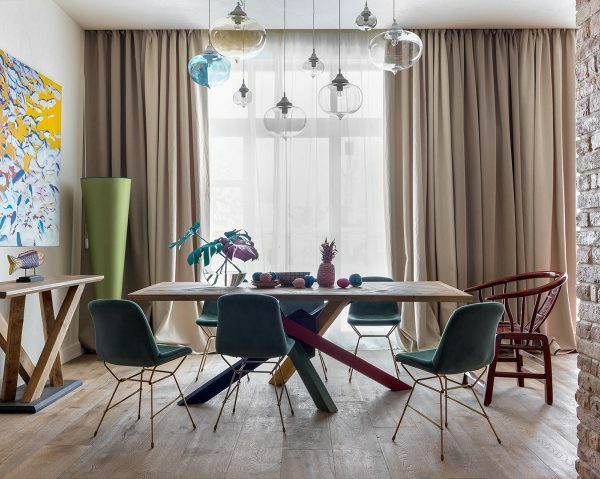 Mix and match dining chairs pick out a couple of the hues. 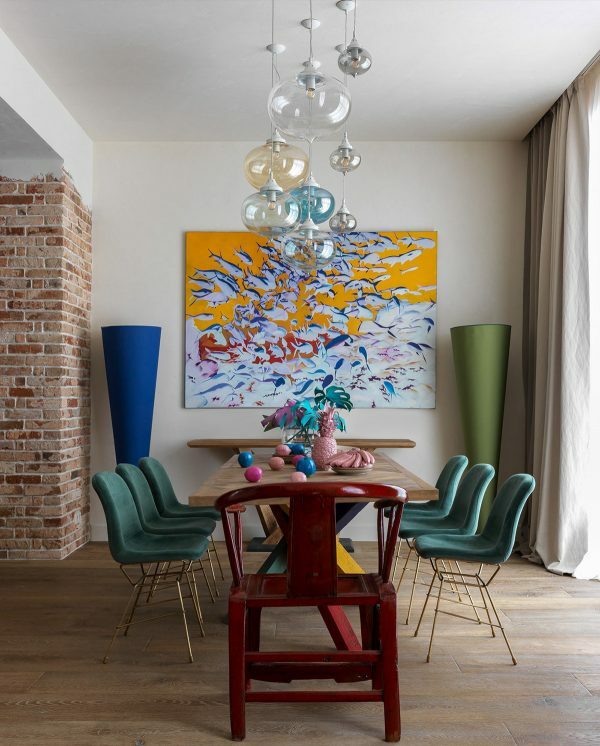 Blown glass light shades dangle like festive ornaments from the ceiling. 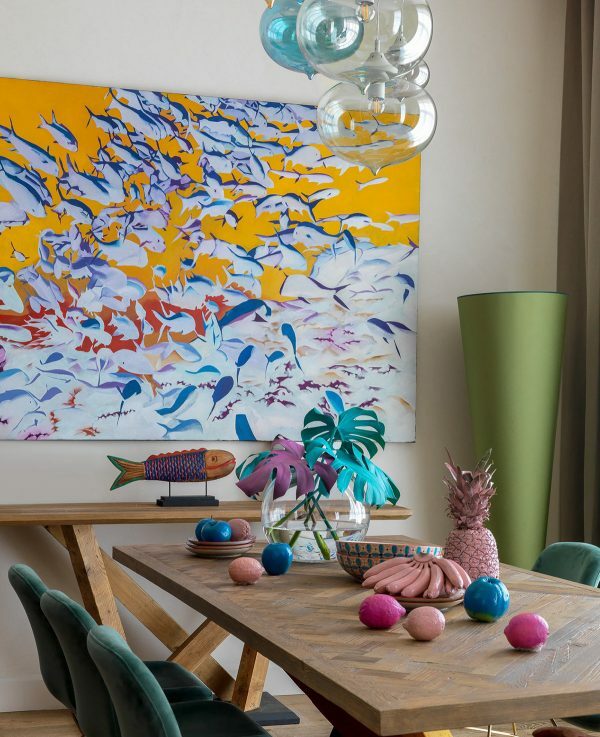 Colourful kitsch accessories adorn the dining table and bright artwork creates movement over the wall. Bar stools perch at the divide between the casual sitting area and the main lounge. 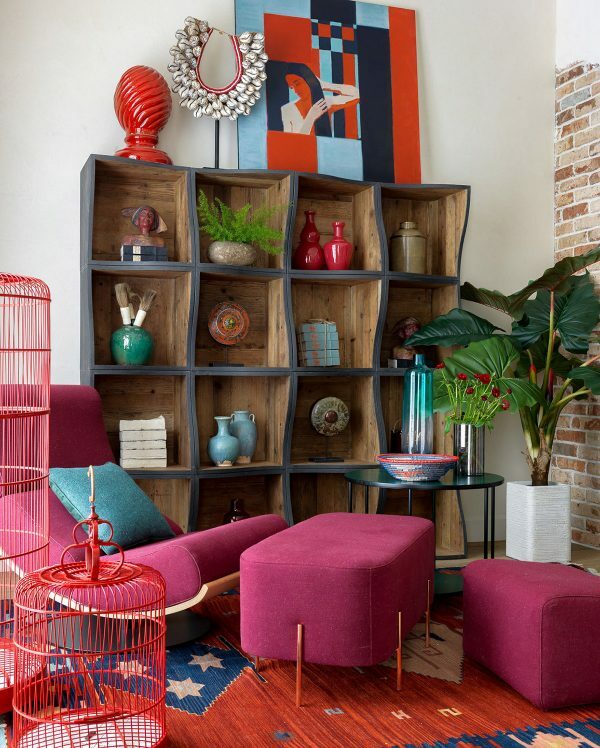 A pink accent chair and matching stools create a crash of colour with a red and blue tribal rug, and red decorative birdcages. Wavy shelving units interlock to create a unique display point for interesting art and keepsakes. 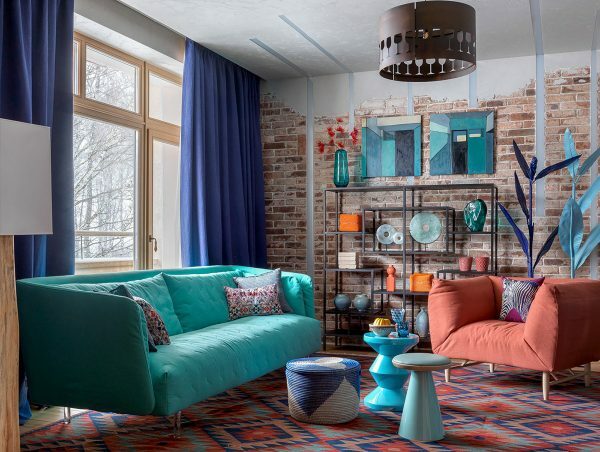 Mismatched glassware brings colour to the bar that divides the room. Blue and orange decor fills a third sitting room. 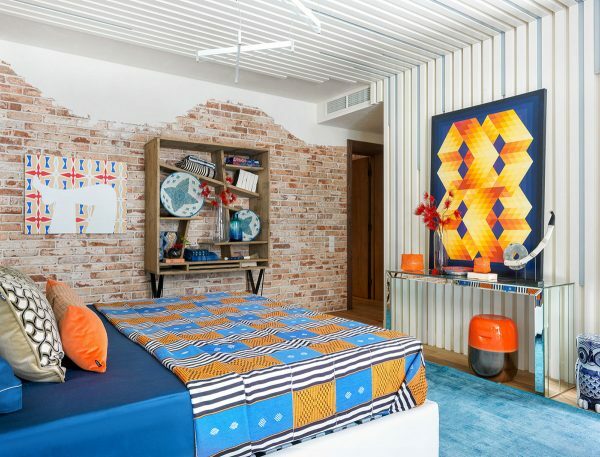 Despite the zany character of the room, the furniture is functional and comfortable. 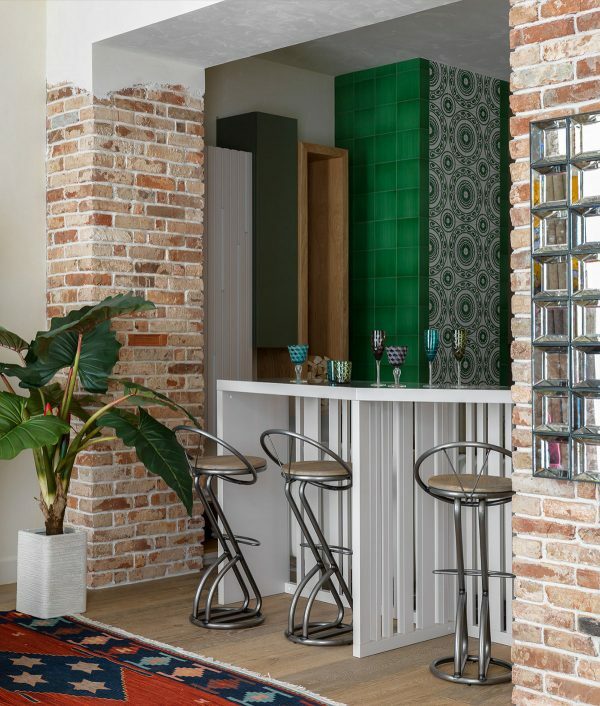 The rustic raw brick walls work as a neutraliser of the vivid colour. 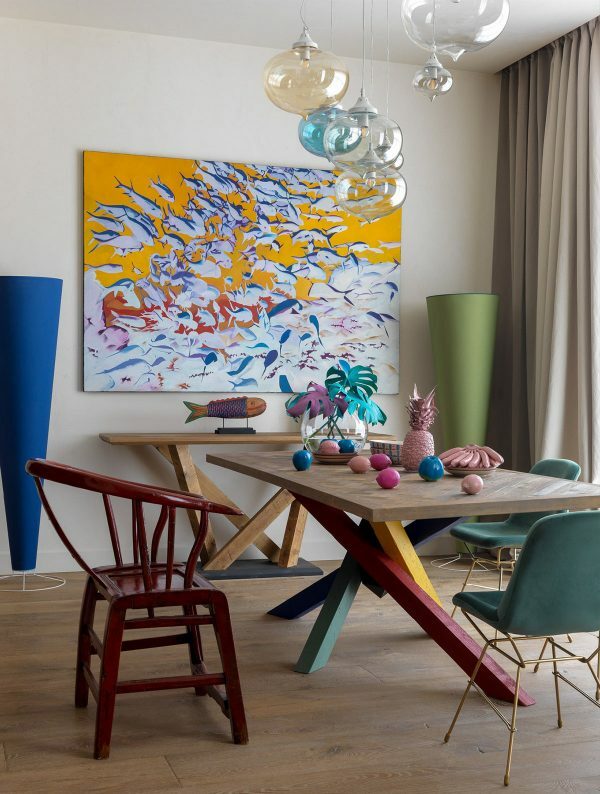 There is a symbiosis of paintings by Russian artists, joyous African fabrics and Uzbek ikats, and flea market finds from Spain and Italy. Layer upon layer goes into the room, with the base layer revealed at the flick of a light switch. 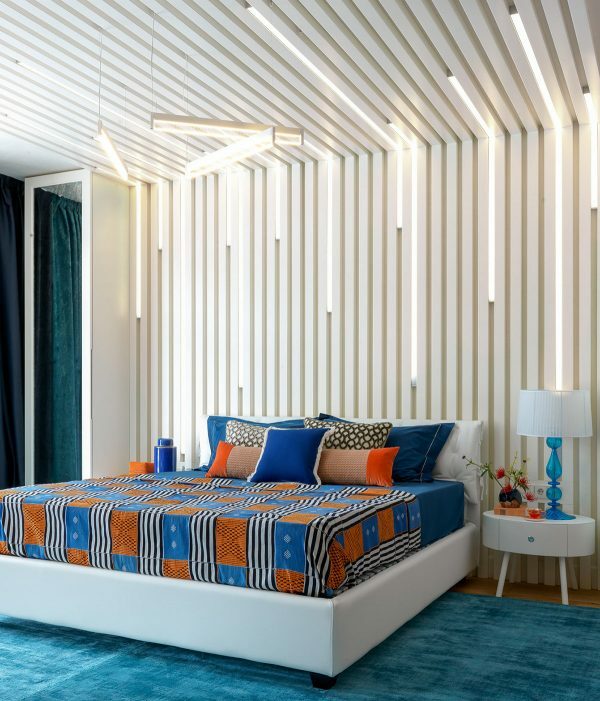 Strips of LEDs cut up the wall and across the ceiling at various lengths and intervals. 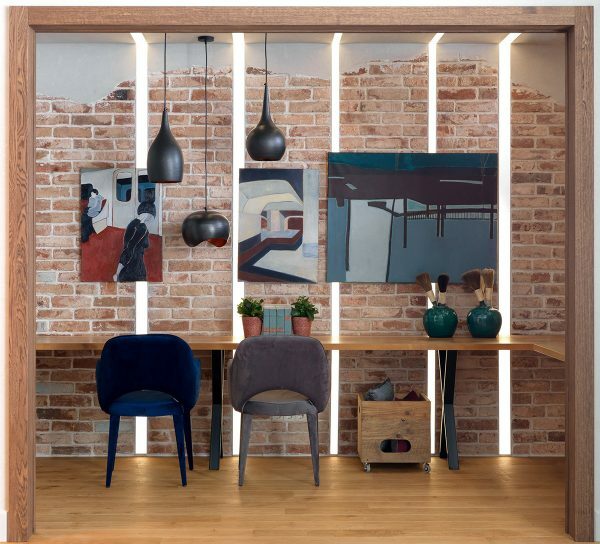 The striped LED light effect is repeated in various widths behind a double workspace, poking out from behind a gallery of paintings. 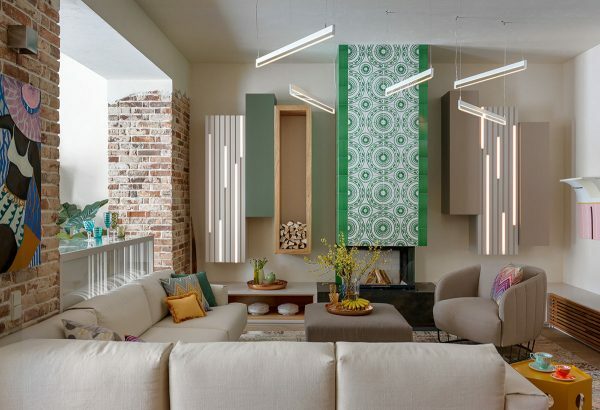 A trio of pendant lights offer alternative illumination. 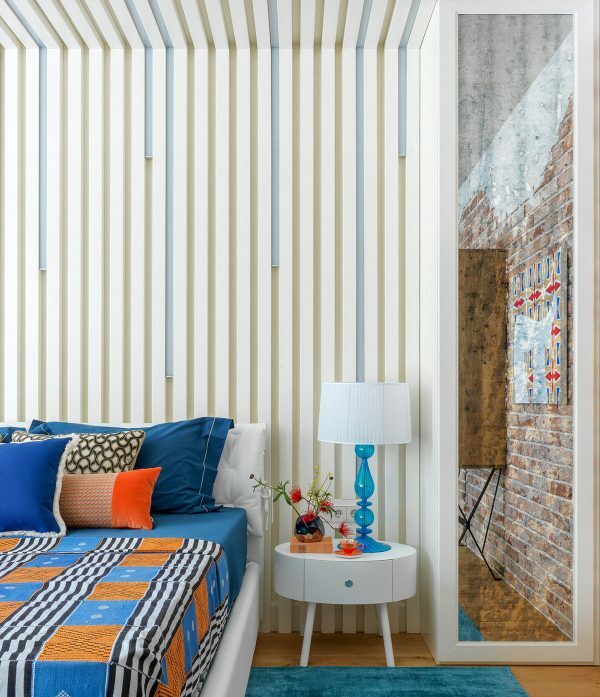 In the master bedroom suite, the LED stripes slot inside the gaps of a white slatted wall. 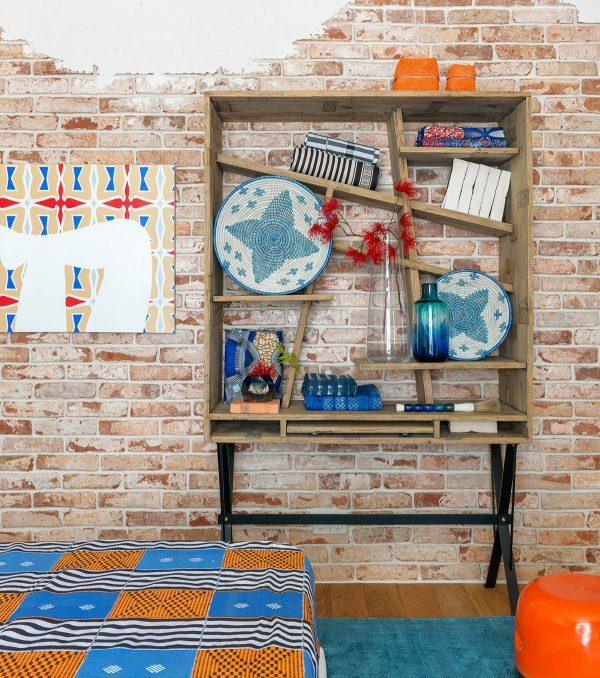 If the feature wall wasn’t busy enough, clashing bedclothes and a multitude of home accessories saturate the room decor with colour. A small white bedside unit stands by a single mirrored closet. 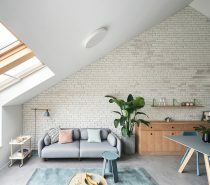 White plaster from the ceiling descends down over the upper part of exposed brickwork walls in a freestyle undulating effect. 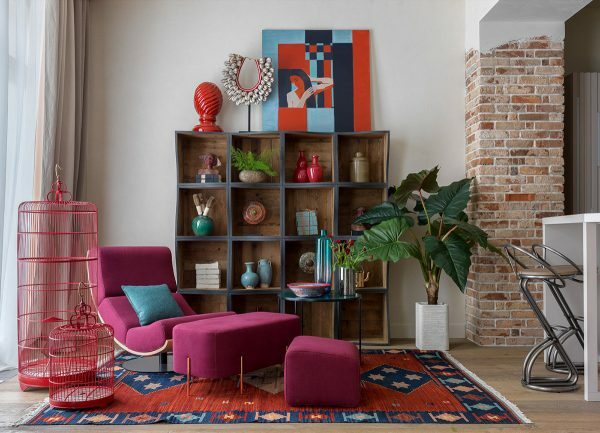 A freestanding shelving unit displays colourful accessories, next to unusual wall art. 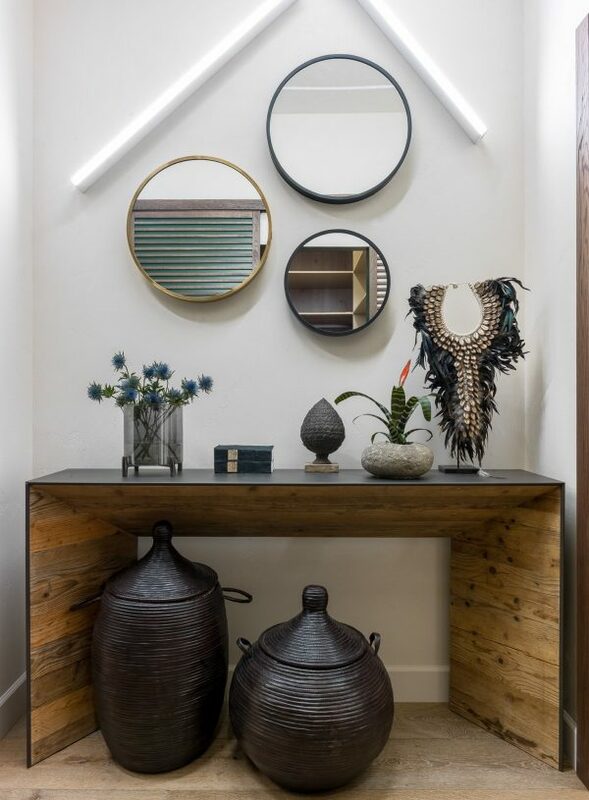 The slatted feature panel with LED lighting runs the length of the ceiling over the bed, and descends behind a mirrored console table opposite its foot. Luxurious ensuite bathroom facilities are framed in a picture window. 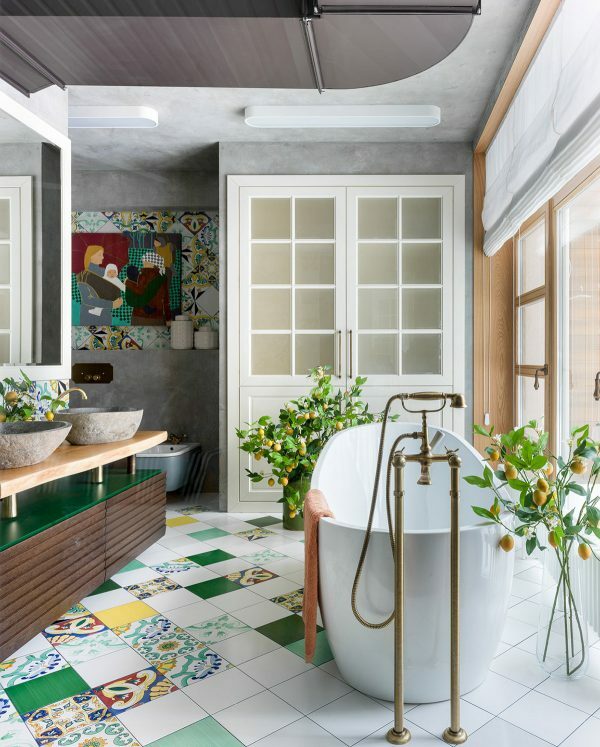 There is a citrus theme at play inside the ensuite, where lemons are bunched on branches around a freestanding bathtub. 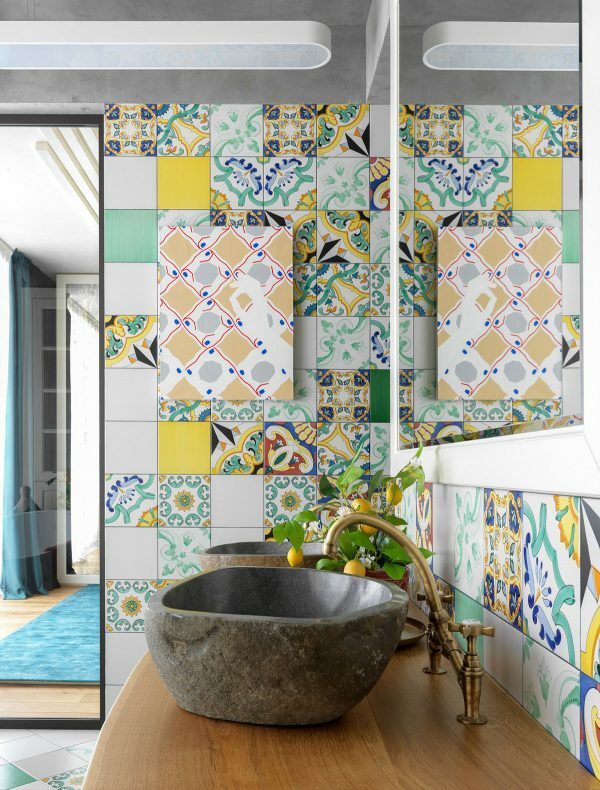 Green and yellow pattern dances merrily across the tile floor and over the walls. 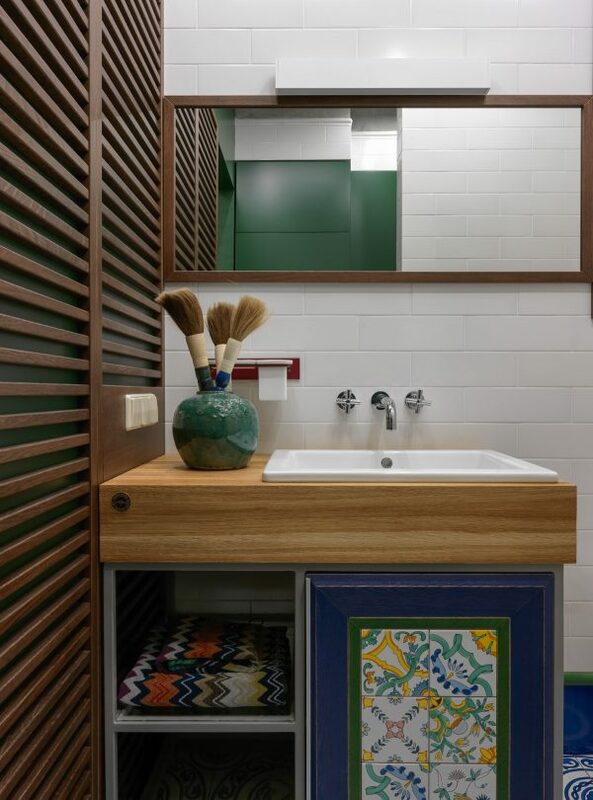 A green vanity unit matches the theme, topped by a live edge wood countertop. 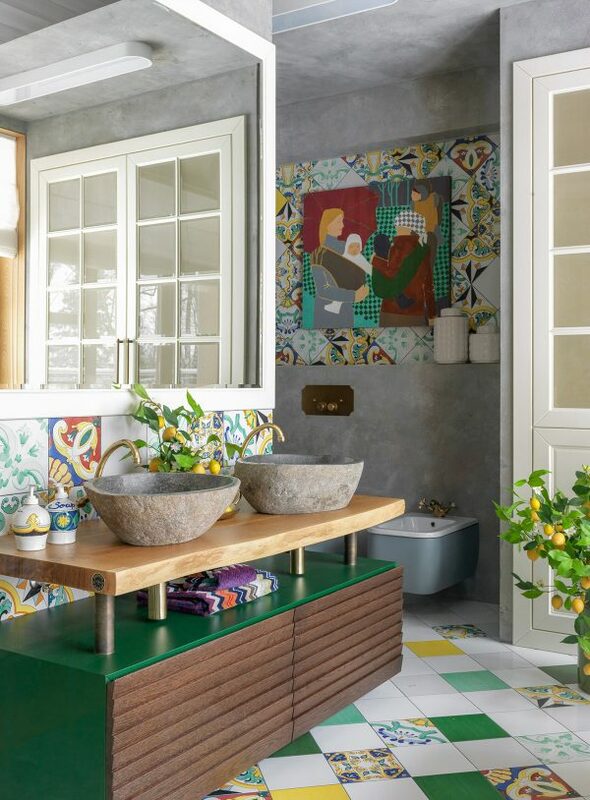 Gold faucets match the yellow tones. 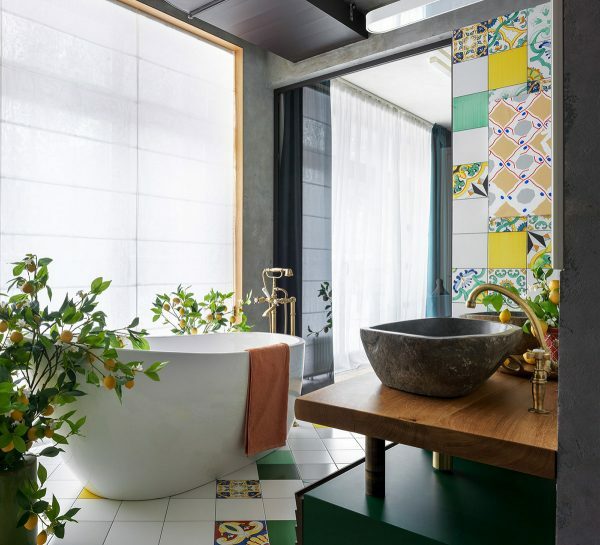 Stone basins bring weight and substance to the light scheme. 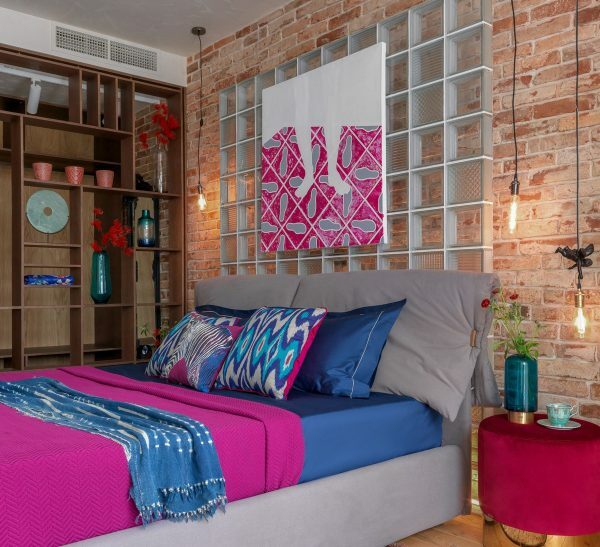 Another double bedroom is a wild magenta and electric blue concoction. 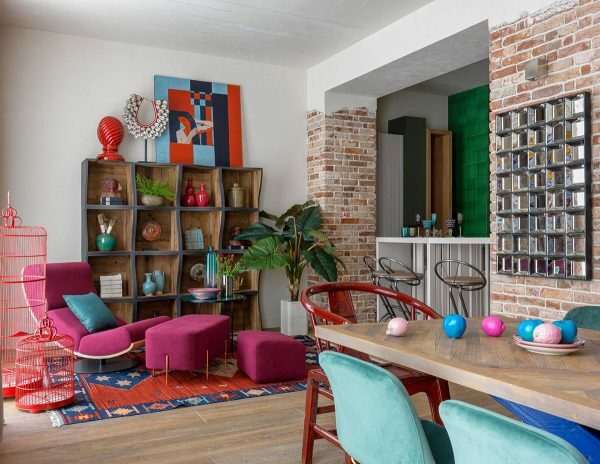 Pink artwork decorates brickwork walls. 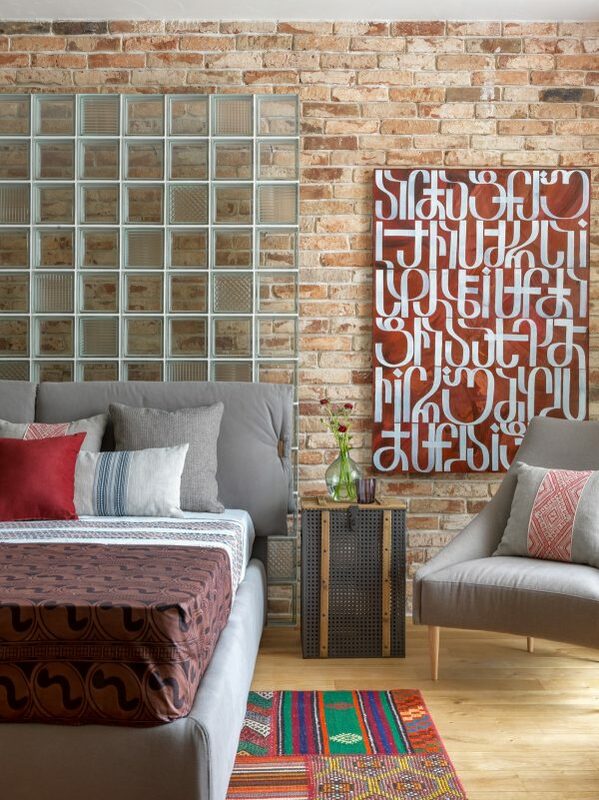 Glass blocks build a headboard feature wall. 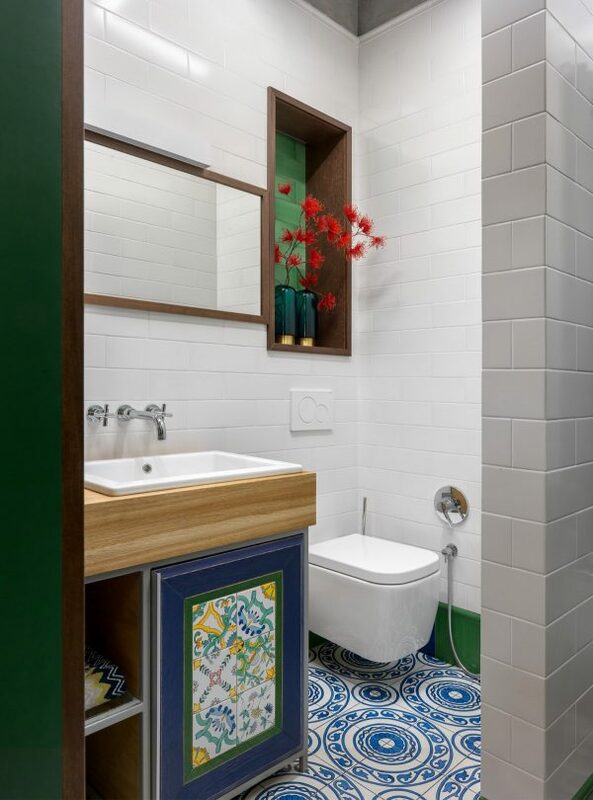 Blue floor tiles colour a small WC. 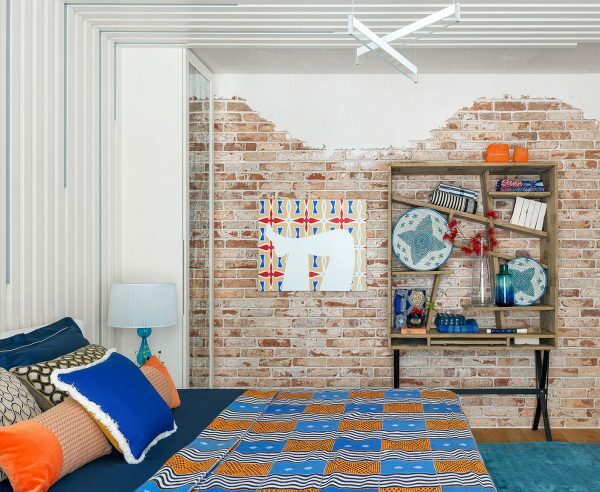 A horizontal mirror helps the room appear wider. 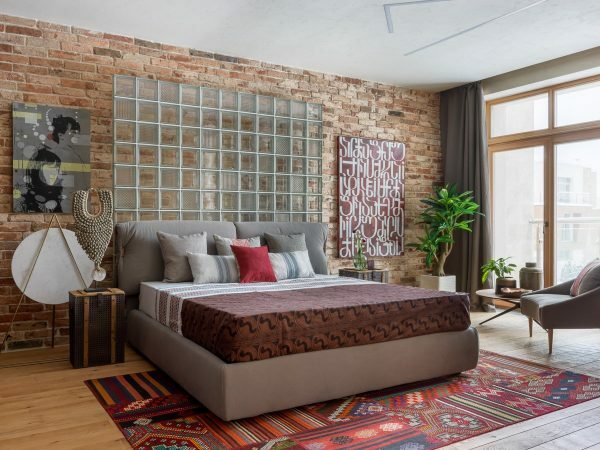 The third double bedroom carries an earthy palette, enlivened by a tribal rug. A rustic chest serves as a bedside table. 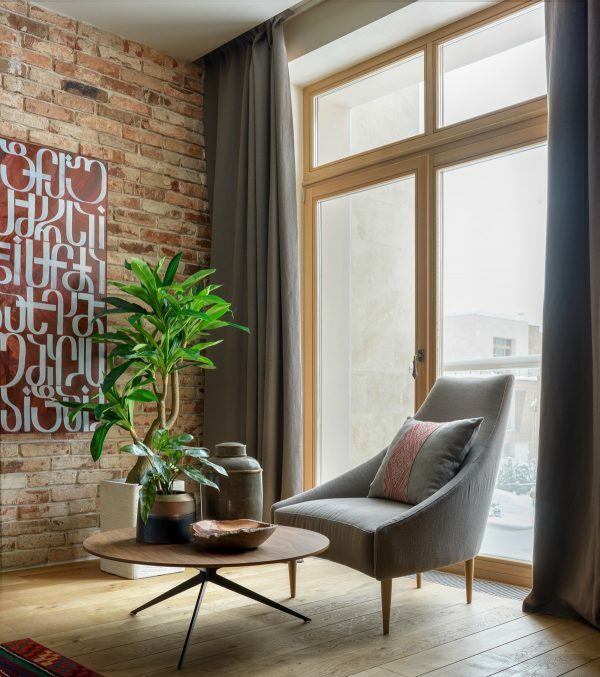 By the window, a comfortable bedroom chair has been paired with a coffee table. 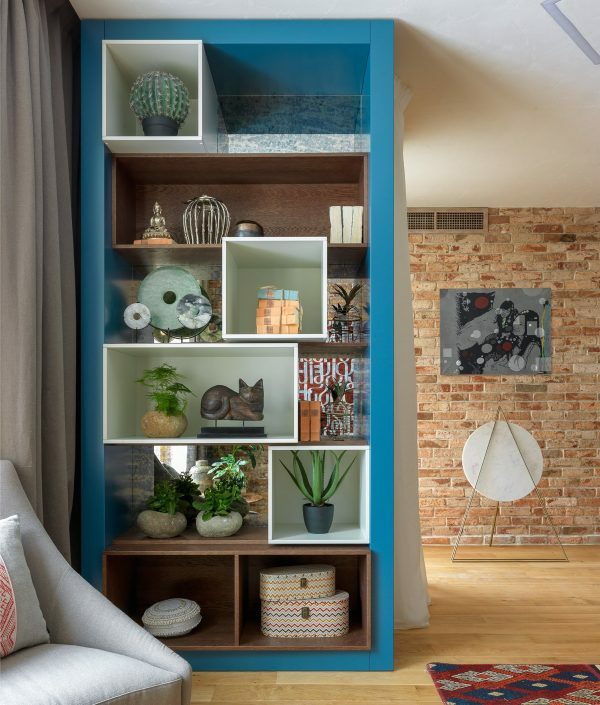 A shelving unit divides the bedroom sitting area from the rest of the space. 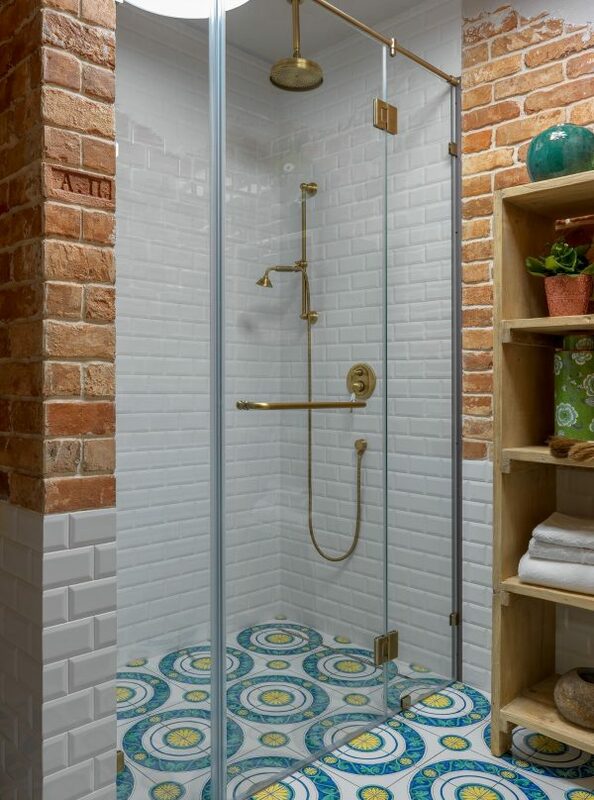 The ensuite shower room has a riot of colour across the floor. 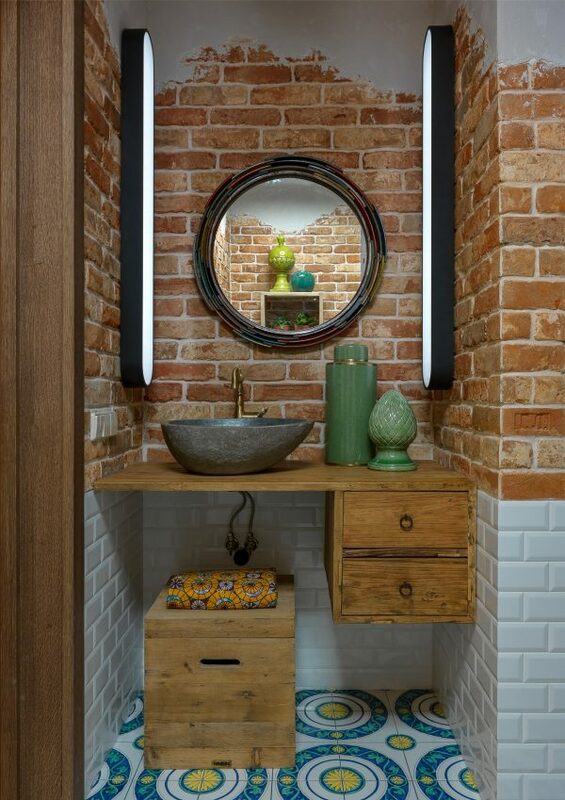 A rustic vanity unit fits into a niche. Despite the overall fun factor, the finishing materials in this home are respectable high quality. 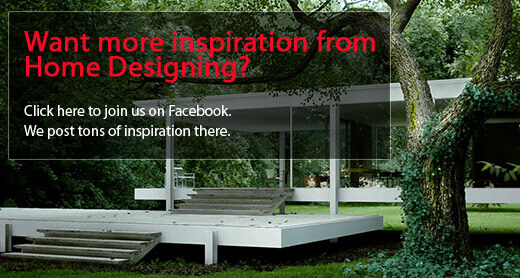 For more regular updates from Home Designing, join us on Facebook. 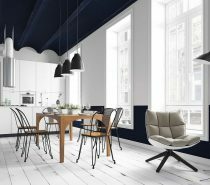 If you are reading this through e-mail, please consider forwarding this mail to a few of your friends who are into interior design. Come on, you know who they are!